Especially after I whined about the brutal winter we experienced here in Boston, it may seem odd that the summer months fill me with anticipation for the start of fall football season. But I can’t help it — I’ve been a football fan since junior high school — so around this time of the year I start checking the magazine stands for the usual rush of pre-season pro and college football previews. 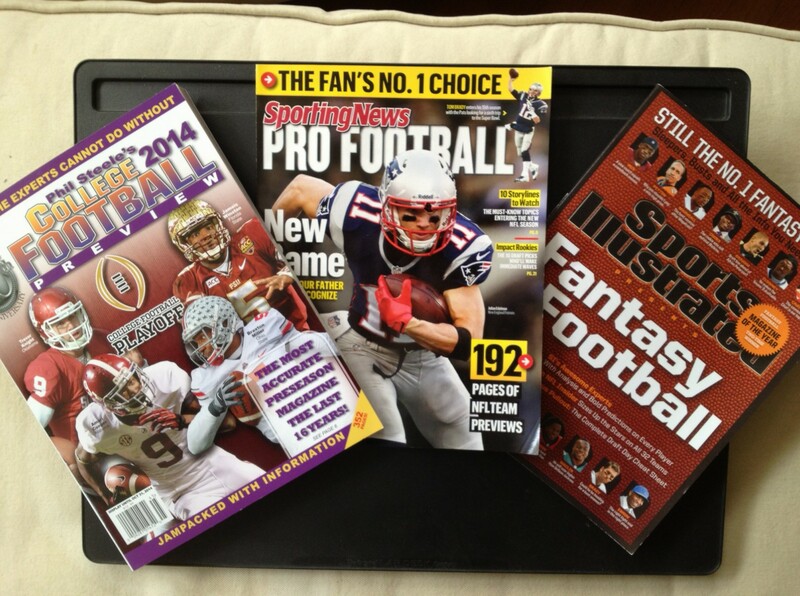 I’m more into the pro game than the college game, but I load up on pre-season mags for both, as well as a fantasy football guide or two. On the pro side, I’ve been devoted to the Chicago Bears since I started to follow the game, over a decade before the awesome, wondrous 1985 championship season. When a Bears game is televised here in Boston, I make every effort to watch it. I still get psyched when they win, and I get a tad down when they lose. Since moving to Boston in 1994, I’ve also become a fair weather New England Patriots fan. It’s easy to root for the Pats when they are Super Bowl contenders practically every season! I don’t know what I’ll do when coach Bill Belichick and quarterback Tom Brady call it quits, however. On the college side, it’s Notre Dame for me. Growing up in NW Indiana, I couldn’t help but gain an affinity. Although I’m neither Catholic nor a Notre Dame alum, I’m drawn into the whole Notre Dame football mystique. I also root for the University of Hawaii and Navy, even though I have no official connections to either of those schools! Fandom is not logical. Personally, I’ve never attended a big name football school. Valparaiso University, my undergraduate alma mater, is known more for its successful mid-major basketball program than for its football team. New York University, my law school alma mater, hasn’t played the game in decades, although early in the last century NYU had a significant football program. On the fantasy football side, my Jamaica Plain Storm won its league in 2012 and generally has been pretty competitive. I pay moderately serious attention to my fake football team. Such are the priorities of willfully prolonged adolescence. I love football, too, and look forward to fall for that, and many other reasons. But I’m sorry to say we part company over teams–I loathe (!!) Notre Dame and the Patriots! Yes, I know, the Pats and the Fighting Irish push buttons!